“Moscow in Poems and Songs” programme was held on September 7, 2015. The Day of Moscow was observed at the RCSC in Delhi, with students and teachers participating in a cultural fiesta. A literary-musical programme “Moscow in Poems and Songs” dedicated to the "Day of Moscow," was held at the Russian Centre of Science and Culture on September 7, 2015. The function, jointly organised with the Institute of Russian Language, was to mark the Year of Literature in Russia-2015. Russian language students from Delhi University, Jawaharlal Nehru University, Amity University (Noida, UP), students of Russian Embassy School and Institute of Russian Language attended the programme. An exhibition of Art Books devoted to the Russian Capital was also on display. 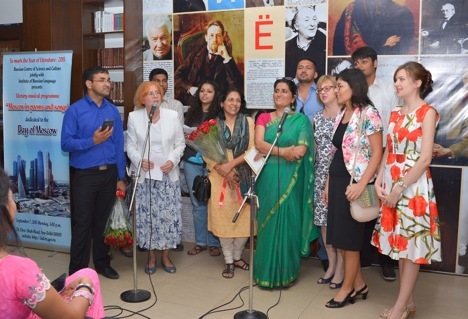 Neelakshi Suryanarayan, Professor, Delhi University, Tatyana Perova, Head of the Russian Language Teachers’ Training Centre, RCSC, Tatyana Shipilova, Director, Institute of Russian Language, and teachers of Russian language, participated in the function. The audience was fascinated by the fantastic world of Moscow. Indian students and students of the Russian Embassy School in India performed songs and read poems about the capital of Russia. Rajat Sharma and Anju Mehta’s group’s rendition of songs most impressed the gathering. Excerpts from documentaries, paintings, photographs and poems and songs formed the highlight of the programme. A screen displayed how Muscovites were celebrating the Day. Indian students shared stories and their impressions from a recent visit to Moscow, and Indians who have lived, studied or worked in Moscow also recounted experiences. Russian Language Institute teachers prepared a selection of facts about Moscow and Muscovites for a quiz, "Moscow - the capital of Russia", which elicited warm audience participation, with the winners receiving prizes. Tatiana Perova presented flowers to winners of an International competition "The best teacher of Russian literature abroad": Delhi University Professor Neelakshi Suryanarayan and JNU Ast. Prof. Sonu Saini.